Recover a stolen silver mold for a silversmith. Speak to Delvin Mallory in Riften. Talk to Endon in Markarth for the details. Travel to Pinewatch and enter the caves from the basement. Make your way to the Bandit's Sanctuary and take the key from Rigel Strong-Arm. Open the room and take the silver mold. Return the mold to Endon. Once you've completed five additional jobs in the city of Markarth, speak to Delvin at the Ragged Flagon to receive a 'special job'. Delvin explains that he has received word from Endon in Markarth of a special request. Travel to Markarth and speak to Endon, who will be in the Silver-Blood Inn for this quest. He will explain that he wants you to recover a silver mold he ordered, which was stolen by bandits in transit. "The only thing I can tell you is that the mold was taken to the bandit's hideout... a small cottage called Pinewatch." If you've already been to Pinewatch and have the mold, he will take it and the quest will be completed. When you enter Pinewatch, a man named Rhorlak may engage you in conversation. You can bribe him into revealing the location of the bandit's hideout, which is opened by a button next to the bookcase in the basement. The button opens a hidden entrance that leads down to some caves. There are three bandits here who can all be avoided by dropping to the lower area and carefully making your way around the back and back up the planks. The exit will be on your left if you fight across the bridge (and therefore on your right if you sneak up from behind via the lower level). The three bandits in the next room are harder to avoid, but this can be done with some careful timing. There is one more bandit in front of the door to Pinewatch Bandit's Sanctuary; this last one is nearly impossible to avoid because of the light sources in the tunnel. If you prefer to fight through this whole section, there is no reason to leave any of the bandits alive. After entering the next section, you'll find several bandits conversing around a table, but they can be avoided by sneaking around the clutter to the left and carefully making your way up the path to the right. The next bandit can be avoided by staying in the shadows. Soon you will come to a dark room with several dead draugr, patrolled by another lone bandit. There is a treasure room to the right which contains an unusual gem and various other valuables, along with a booby-trapped novice-level chest. Past the draugr room is a living area, with a shared bedroom separated by a wooden partition from a bar, where several bandits will discuss their leader's obsession with protecting her treasure. It is very difficult to sneak past all of these bandits, due mainly to the firelight and the directions the bandits face. With a high Sneak skill you can sneak past by hugging the left wall, or you can use a short duration invisibility effect and sneak straight through the middle of the room (even eating vampire dust may work with the right timing). Next is Rigel Strong-Arm's room. She alternates between sitting at the table, patrolling the next tunnel, and sleeping. The first part contains six bone rattles, a workbench, and a potion on the shelves. Her bedroom contains a potion on the dresser, a leveled weapon propped against an apprentice-locked chest, and a leveled soul gem on the bedside table. Rigel carries the Pinewatch Treasure Room Key, and you do not need to kill her to complete the quest. Rigel has taken a few precautions and set up some traps to stop anyone from getting to her treasure. The room after the next tunnel contains a bone rattle and a master-locked door, which can also be unlocked by the treasure room key. There is a pressure plate before the bridge, which activates darts from both sides. At the start of the next tunnel is another pressure plate that activates blades in front of you, and another plate at the far end that activates a battering ram from the right. After that is a metal pressure plate that activates a mace from the right. Opening the final door before the treasure room activates another mace, while the final trap is a metal pressure plate which activates darts from the walls and ceiling. Your patience and fortitude is rewarded by a random and leveled assortment of potions, ore, ingots, coin purses, loose coins, and enchanted armor, and of course the silver mold. There is also a leveled chest beside the exit door, which opens to behind the barred door in the first section of the caves. If you left the bandits alive, you can again drop to the lower level and sneak back to the house area of Pinewatch. Return to Endon and give him the mold, and he will reward you with an enchanted piece of armor, and offer his services as a fence. Report back to Delvin. He'll compliment you on your success, "I hear Endon's quite pleased to have his merchandise back. He's a powerful ally in Markarth. Should help the Guild regain a foothold in the west." He will also inform you of a new merchant setting up shop in the Ragged Flagon. After completing this quest, three Thief Cache barrels will appear around Markarth. If you press the button in Rhorlak's basement without hearing about it from him first, he will turn hostile towards you. 10 Endon, a silversmith residing in Markarth, has requested assistance from the Thieves Guild. 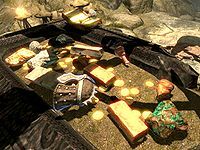 20 Endon had a silver mold stolen while it was en route to Markarth. The item in question was taken by a group of bandits led by Rigel Strong-Arm and brought to their hideout at Pinewatch. 200 Finishes quest The silver mold has been returned to Endon, and the Thieves Guild can now count on him as an influential ally in Markarth. On the PC, it is possible to use the console to advance through the quest by entering setstage TGTQ01 stage, where stage is the number of the stage you wish to complete. It is not possible to un-complete (i.e. go back) quest stages, but it is possible to clear all stages of the quest using resetquest TGTQ01. This page was last modified on 3 February 2018, at 00:56.